I have fond memories of visiting Japan, arriving to the spectacular skyline of Tokyo is a memory I will never forget, I was also very lucky to visit Hiroshima and Nagasaki, two places embedded in history for all the wrong reasons but it was the food that really enticed me. I spent two days in the beautiful city of Kyoto and it was there that I tried Japanese food and in particular sushi for the very first time and instantly falling in love. It was not just the sushi that sold it to me, that very first taste of Kobe beef, wasabi and miso, that first dip and bite of a gyoza, the endless variety of ramen’s and sweet wagashi, first time experiences that any food lover will never forget. Fast forward a number of years and Japanese restaurants and ingredients are embedded in our society now alongside the more staple Asian cuisines such as Chinese, Malaysian and Vietnamese. 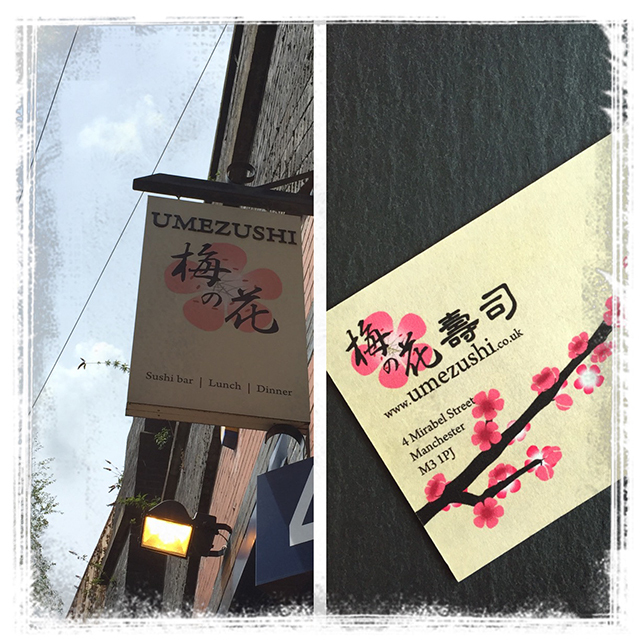 Whilst I appreciate chain restaurants like Yo Sushi and Wagamama bringing a taste and flavour of Japan to the masses, it’s the small independents that will always bring out the authenticity of how it should be and this is where Umbezushi steps in. I know saying somewhere is a hidden gem is a cliché but this restaurant really is because if you didn’t know it was there you would never know about it, just a little off the beaten track on Mirabel street close to the Arena you will find it built into an arch under the railway line. Umezushi seats only 22, an open kitchen with seating alongside, a few tables and simply fitted out with wooden panelling, very reminiscent of a small neighbourhood restaurant you would find in almost every city in Japan. Andy and I visited on a Friday lunchtime and throughout our hour and a half stay there was a steady stream of customers all of which were looked after by Joshua our waiter who was knowledgeable, friendly, and efficient, he quite clearly had an enthusiasm for the place and clearly enjoyed working there. The menu has your full range of sushi options, taster menu’s, ‘things in a bowl’, platters, side dishes and desserts. 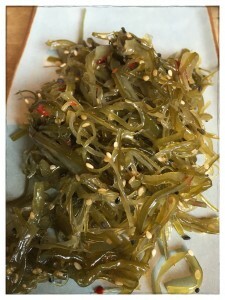 There is also a specials selection which is changed consistently depending on what ingredients are available. You only have to look at their suppliers on their website to realise that they take their ingredients seriously, quality and freshness is of the upmost importance. Edamame and wakame salad. I’m a creature of habit when visiting a Japanese restaurant and always order both of these items if they are on the menu. 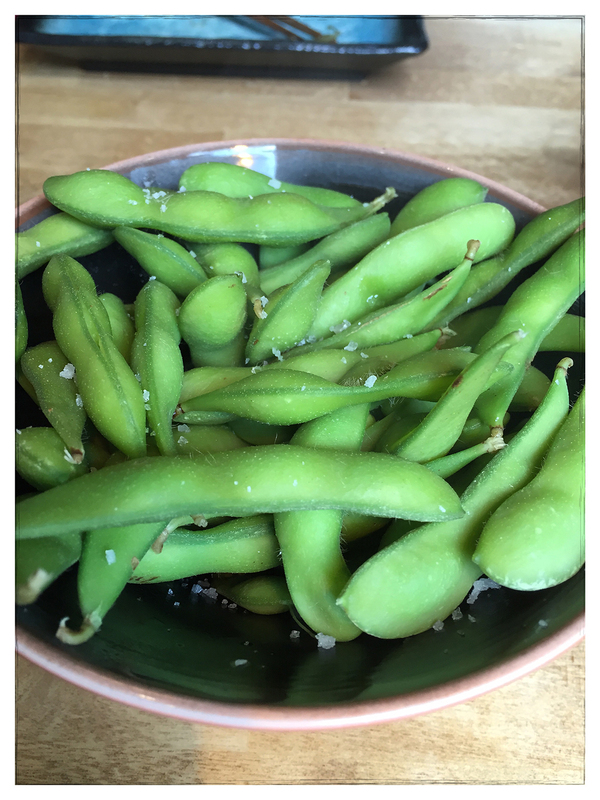 I love edamame in their pods, these were just perfect and the wakame salad was the best I had tried in a long time, the seaweed had just the right crunch to it and the flavours perfectly balanced, too often this salad is soaked in far too much mirin and is completely spoiled. Roasted Salmon head. Andy and I will always verge on the adventurous whilst dining out and this was no exception. I know a lot of people who can’t even stand seeing a fish fin let alone a head so only seeing a head would be an absolute nightmare. 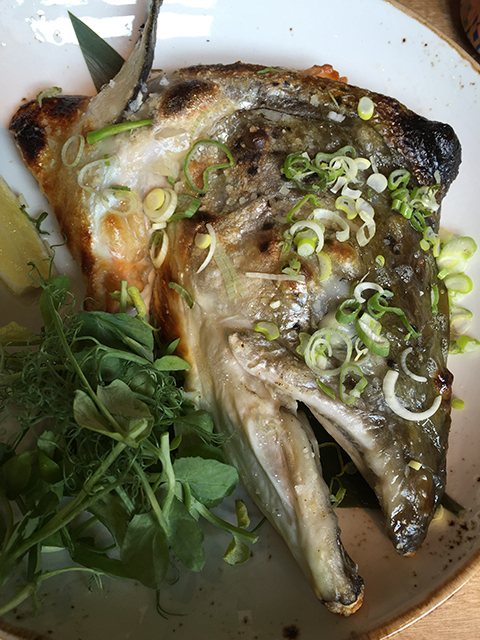 This was however a revelation, there was lots of succulent pinky flesh to eat and the salmon cheeks were so tasty they should be on the menu by themselves, if we can have cod cheeks then why not? The crispy skin only went to prove how perfectly cooked this head was however neither of us were willing to try the eyes, both of us drawing the line there. Hamachi sashimi. Otherwise known as yellow tail or Japanese amberjack, a common fish used in sushi. 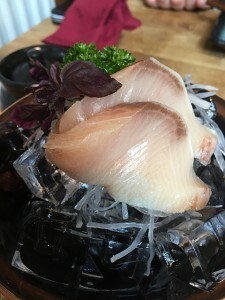 Beautifully presented on ice with purple shiso leaves, this is how sashimi should be, an appreciation of how wonderful raw fish is in all its glory. 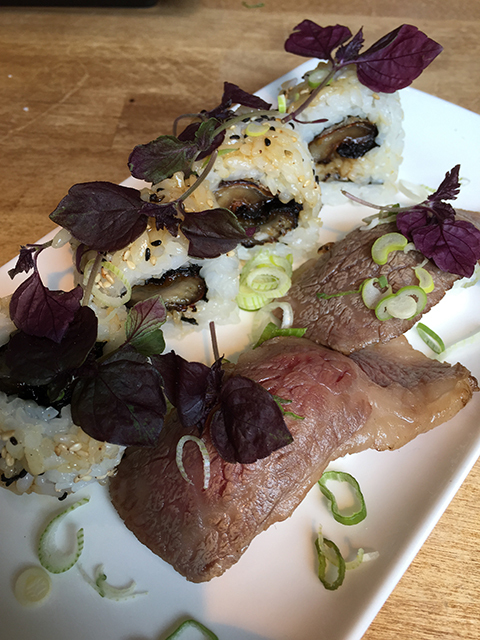 Wagyu Nigiri. Wagyu beef is the more easily available version of the infamous Kobe beef. I’m not being submissive here, this beef was tender and full of flavour but nothing can beat fresh Kobe beef in Japan, and Japan is the only place you are likely to experience it without paying a small fortune. Freshwater eel uramaki. For me this sushi proved that Umezushi can do things right where other places so easily fail, the rice was just warm with a slight hint of sushi seasoning, packed just tight enough around the eel to hold it together and pick up easily. Proof indeed that your sushi is made to order and worth waiting for. You’ll never find it this good on a conveyor belt. I had a Dr Loosen Riesling with my meal which was refreshing and fruity and not overly sweet, Andy had a brown rice tea which he didn’t really enjoy other than the beautiful cup it was served in. Is the one toilet at the venue disabled accessible? Good question, it’s on the same level but I guess it would depend on the disability. Tables and chairs would have to be moved for a wheelchair to gain access, I doubt there would be much room for manoeuvre though.